Page Street Publishing, 9781624147951, 192pp. Full of inspiring ideas for seasoned refurbishers and the know-how to get anyone started, Amazing Furniture Makeovers helps you give your antique pieces new life without losing any of their vintage charm. Jen Crider, founder of Girl in the Garage, breaks down everything you need to know about furniture makeovers—from basic chair reupholstery to remaking coffee tables into benches. There won’t be an article of furniture you can’t make more beautiful, functional, and personal. This book makes it easy to transform whatever old or wobbly furniture you have into something better than new. Each chapter walks you through unique projects to illustrate Jen’s straightforward approach to furniture styling and repair, and these techniques can be used on a variety of pieces. Learn to decoupage a bookcase with maps for a classy look. Transfer original images onto large-scale furniture for a style all your own. Dress up an end table with a distressed paint job to add farmhouse flair to any room. Every new technique will give you the confidence you need to get remarkable results on your first makeover—and every makeover after. Jen Crider is the founder of Girl in the Garage. Her work has been featured in Better Homes and Gardens, Woman’s Day, Country Living, and This Old House. She lives in Valparaiso, Indiana. "I highly recommend this book if you are looking for inventive ways to transform your furniture into one-of-a-kind pieces that will make your home truly your own." 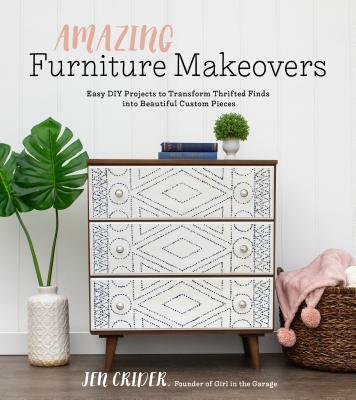 "Jen’s book, Amazing Furniture Makeovers, is truly that…amazing! I’ve been refinishing furniture for 25 years and I’m astounded at these furniture makeovers that Jen has created and how easy it is for anyone to do. This book is a must buy!"